Keep your home free of less-than-friendly energies using these four cleansing rituals. We're only here for the good vibes—how about you? Keep your home free of less-than-friendly energies with this super thorough kit. Using four different rituals believed by some to bring cleansing energy, you can lose the bad juju after a tiff with your partner or encourage a fresh start when you move into a new place. Or simply use it to add a little aromatherapy to your daily routine. 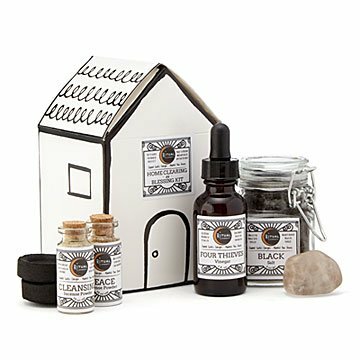 Includes cleansing incense with charcoal tablets, black salt to protect against negativity, Four Thieves vinegar (a salve against bad energy since medieval times), a smoky quartz crystal, peace incense, and instructions on how to use 'em all. Packaged in a gift-able box, it also makes a truly magical housewarming gift. Handmade in Texas. Nique Arr-Richards believes that we can all achieve the lives we want, so long as we align our intentions with the energies that already exist right here on Earth. Born to a spiritual family, she was raised to be passionate about the gifts Mama Earth has provided us with, and the power of natural healing. She’s certified in herbalism, aromatherapy, and crystals. As an empathic intuitive, she has been reading tarot cards for over fifteen years. Using her experience and training, she creates rituals to help people cleanse their spaces and find peace in their day-to-day. CAUTION: Place charcoal on a fire safe surface or dish. Pro Tip: Light your cinder in a well ventilated area and set aside for 2 minutes to allow it to fully ignite before adding incense. I got this because I had some weird roommates move out and I wanted to get their vibes out of my house. I'm a spiritual person and I know how energy can linger. I use incense and sage regularly and I wanted something more in depth- this kit was perfect. It has several steps to thoroughly remove negative energy in lots of different ways. I spent a couple hours doing the process and cleaned my house as part of the ritual so that felt good too. There is enough stuff left over to where I can use the products again, and the instructions gave me lots of ideas on how to use them so I like that. I like the "Peace" incense a lot it smells really good. I would definitely by this again if I needed it, or give it to friends that could use it.